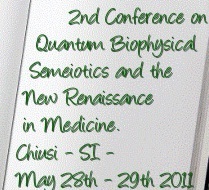 The 'International Society of Quantum Biophysical Semeiotics' - SISBQ - is a no-profit organization which pursues social, civic and cultural aims involving ethical, scientific and spiritual research. It has the primary purpose to promote in medicine, science and civil society in general, the principles, methods and works on 'Quantum Biophysical Semeiotics', created by Dr. Sergio Stagnaro, in its theoretical and practical aspects, by mean of diagnosis and preventive therapy. The organization promotes education, research and applications of Quantum Biophysical Semiotics, and promotes disseminates and distributes, in Italy and abroad, the whole scientific production. In pursuing these objectives it collaborates with Health Authorities, Universities, Hospitals, public and private organizations operating in the area of health, scientific journals, editors, research centers, and any other institution with competences in educational and vocational training and research at local, national and international level.